Should your business acquire traditional on-premise enterprise resource planning (ERP) solutions? Or should it invest in emerging software-as-a-service (SaaS) based ERP solutions? Software as a service (SaaS) is a fast growing alternative to traditional on-premise enterprise resource planning (ERP) solutions. But just because something is hot doesn't mean it's necessarily the right recommendation. For many, on-premise may in fact be the better solution. The key is understanding what's right for your particular business. This is a comprehensive comparison of both hosted and on-premise solutions. It certainly will not answer all of your questions, in fact it should actually start you generating your own questions. Any good paper will do that. The reality is that after reading this paper, you will not run out and switch your system type. You might feel comfortable that for the moment that you are doing the best you can with the available resources. What you will get beyond the basics from reading this is a new set of questions and possibly concerns that you can share with your trusted advisor. These will provide great insight as you look to make upgrades or replace your existing systems. Dolvin Consulting looks forward to helping you navigate the constant flux in technology. We partner with industry experts to deliver solutions to your challenges. Contact us today to see how we may help your business. 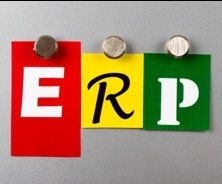 Should ERP be a Technology Project?